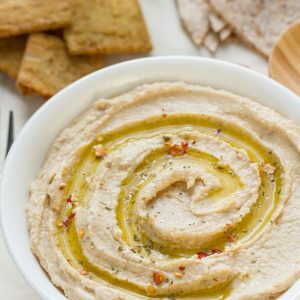 This Simple Easy Hummus Without Tahini is super simple to make and just perfect for a quick snack. Best of all, takes less than 10 minutes to prepare. Cheaper and better than the packaged stuff. I love hummus. It’s one of those things that tastes better when it’s homemade. When I discovered how ridiculously simple it is to make at home, my life forever changed. 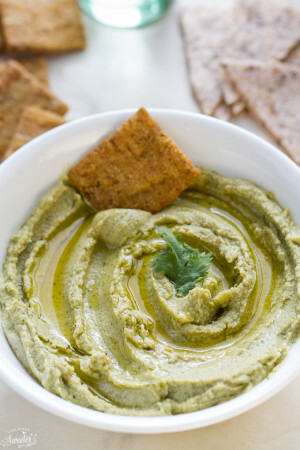 Basically, if you own a food processor or a blender you can whip up delicious homemade hummus in less than 10 minutes. Plus any other seasonings you like. I love adding roasted garlic to bump up the flavor. Or even some cayenne pepper and red pepper chili flakes for a kick of heat. 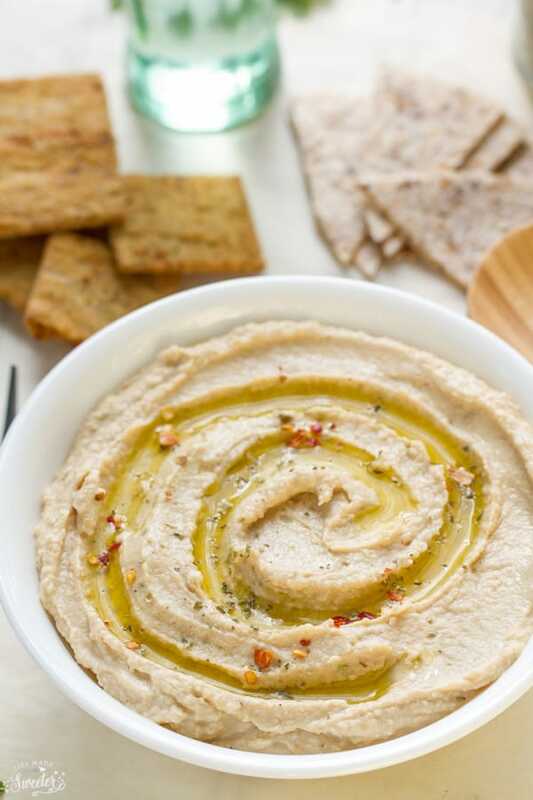 This hummus is so easy, simple and super satisfying. 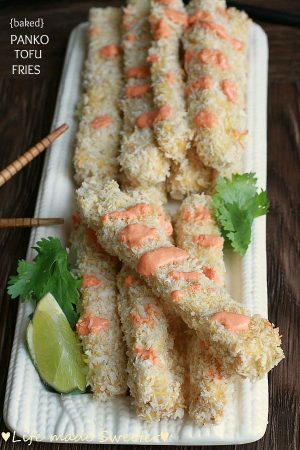 Serve with some pita bread, chips or some veggies. It’s also delicious as a sandwich spread – or enjoy it straight from the bowl. 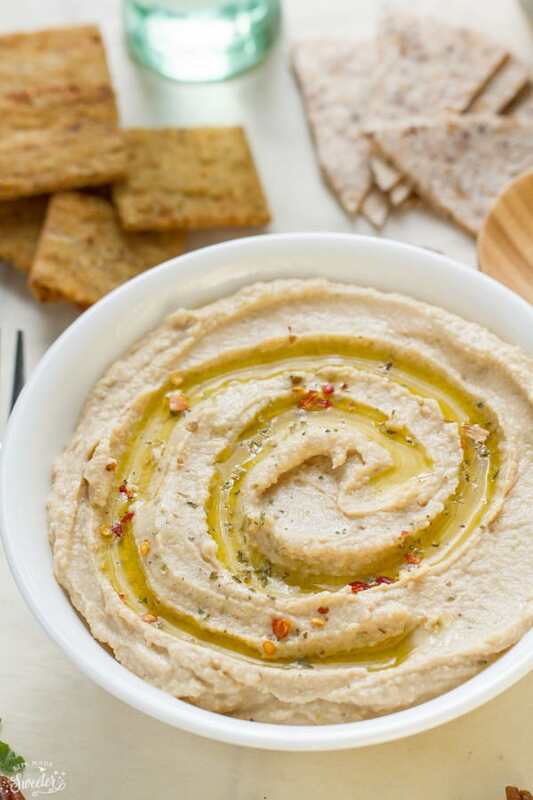 This Simple Easy Hummus Without Tahini is super simple to make and just perfect for a quick snack. Best of all, takes less than 10 minutes to prepare. Place chickpeas in a blender or food processor with garlic, lemon juice, paprika, cumin and reserved liquid from the canned chickpeas. Blend or puree until very smooth, adding more liquid or lemon juice as needed to thin out to desired consistency. 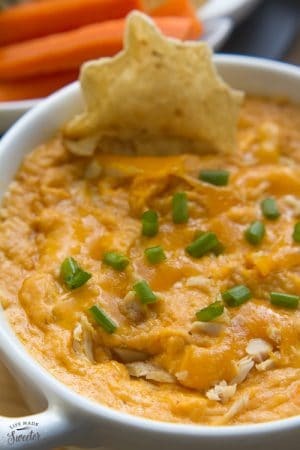 Season with salt and pepper and add 1-2 tablespoons of olive oil to help achieve a super creamy texture, if desired. 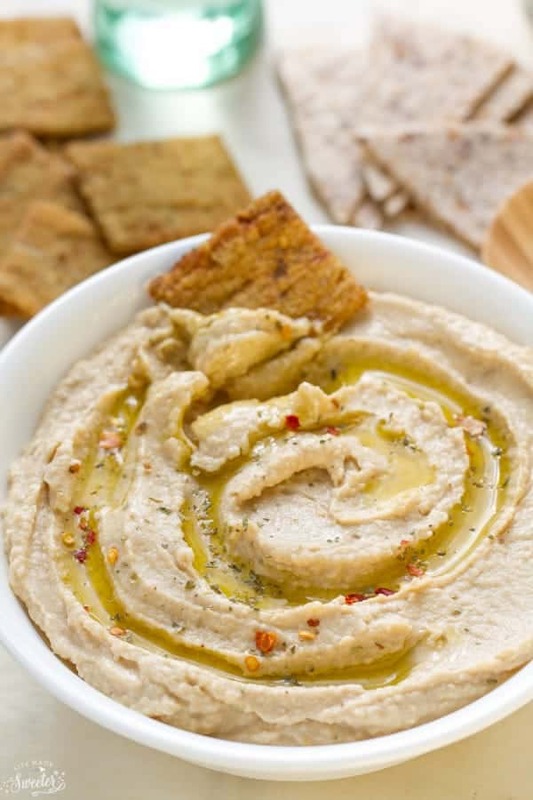 Serve on pitas, crackers, veggies, or sandwiches. Adjust seasonings as you like and sprinkle with red chili flakes if desired. *Can store in an airtight glass container in the fridge for up to 5 days or freezer for up to 3 months. Kelly this looks GREAT! Nicely done! Have a wonderful week! 2) Yes, this can be frozen in an airtight covered container (be sure to use a container large enough that you don’t have to pack it all the way to the top since this expands). Thaw overnight in the fridge – you can also heat it up if you like it warm. Be sure to give it a good stir before serving and you might have to add a little bit more seasoning since the freezer does change the taste a bit. Made this with a bag of frozen garbs about equal to 3 cans. Used 6 cloves garlic, 3 T olive oil, about a cup of water as they had been soaked but not cooked, double the amt of spices, and added 1 T worchestershire sauce, 1 tsp curry and one cup greek yogurt. Turned out very good and creamy. Want to try the other recipe with spinach – yum!